My healthy budget goal is to eat seasonal, home-cooked meals while sticking to a $400 monthly budget for all food including groceries, dining out, entertaining, vitamins/supplements, and spices/herbs. There’s two of us eating 3 (mostly) meals per day. Breakfasts are usually light, and we try to eat left-overs for lunch. My husband occasionally eats take-out lunch at work, & that $ comes out of his personal cash stash. December – Month Two, Week Four – End of Month! It’s the end of December’s budget and I’ve spent a total of $491.51. Yes, as expected, I’m over my $400 limit. There were a couple of stock-up opportunities that I couldn’t resist. iHerb.com* was having a great sale: groceries 10% discount, plus an extra VIP 12% discount, so I couldn’t resist stocking up on a few grocery items like Crofter’s jams, Bob’s Red Mill cereal & corn flour, Lundberg brown rices, and caraway seeds. Since I also include supplements in my food budget, the fish oil & vit D I ordered took a big chunk out of my budget. The local grocery was having a decent sale on King Arthur flours, so I bought 3 whole wheat and 1 AP. Then there’s the yummy take-out for New Years Eve! The overage will be dutifully deducted from next month, leaving $308.49 for January’s budget. After my CSA meat delivery, it’ll leave approximately $56 for each week; we usually spend about $15-20 /week for dining out, so I have my fingers crossed I’ll make it. If not, I’ll just deduct the difference again in February. 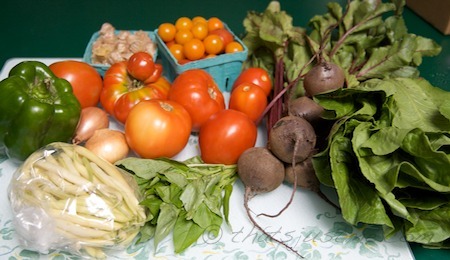 Groceries: $ 316.44 – includes my $80 CSA Meat delivery. I’m looking forward to January – brand new year, a new start, I’m hoping I can keep this up! Saturday: Christmas eve at inlaws, hmm, yummy. Sunday: More yummy Christmas feasting. Saturday: Take out Chinese New Year’s Eve!!! Want to Join the Project Food Budget? Happy New Year! Make 2012 the year you start your own food budget! If you’d like to participate in the Project Food Budget, get the details and let Emily know you’re on board! *Link to iHerb.com is an affiliate link. Click on it, and you’ll get $5 off your first order, and I’ll get a commission. I’ve been buying from iHerb for many years, and they keep getting better and better. They’ve never let me down and their prices are excellent! Is the New Year the Best Time to Start a “Healthy Diet”? Why is it that the majority of “healthy diets” started on January 1st fail? Well, first off, winter seasonal food choices are limited. Yes, carrots, sweet potatoes, beets and other root veggies are yummy, but are they exciting enough to keep someone motivated to continue eating healthier foods? Then there’s the fact that winter weather is brrr cold, with more time hibernating in our homes. Days are shorter; by the time we arrive home to start cooking dinner, it’s dark. Some of us even feel a touch of winter depression. Physically and emotionally, it’s not always a “happy” time of year. Wouldn’t it wiser to start a new lifestyle change when our bodies and minds are happier, say, during the spring or summer? Springtime represents a fresh beginning; our gardens are renewed with fresh flowers and fresh produce choices starting to pop up. By the time summer hits, we’re plentiful with berries, tomatoes, stone fruits, green lettuces, summer squash, eggplant, green beans, peppers, and melons. The days are longer, the sun is shining and it’s easier to be more active outdoors. We just feel better in the warmer months! No, I am not trying to discourage anyone from making a healthy New Years resolution, but perhaps concentrate on something specific that you can easily accomplish. Instead of a general all-encompassing promise to “live healthier”, start small with a promise to reduce the sugar and cream in your coffee. Or perhaps a promise to eat home cooked meals at least 4 nights a week. How about making homemade lunches or eating oats for breakfast every morning? Take tiny steps, and your goals will be easier to achieve. Once you have a few smaller successes under your belt, deepen your commitment to lower your calories and lose weight. Hmm, I wonder if New Years Day was celebrated in the spring, would those healthy resolutions be easier to keep? Author debbie @ That's Just MePosted on December 27, 2011 December 22, 2011 Categories Food, Health & FitnessTags depression, diet, FOOD, healthy, New Years resolution, vegetables, winterLeave a comment on Is the New Year the Best Time to Start a “Healthy Diet”? Ugh, I know she has a lot of fans, but I find ALL of the Jennifer Hudson Weight Watcher commercials extremely annoying. Her voice sounds like screeching nails on a chalkboard, and this new commercial is no exception. The commercial opens with the “old” Jennifer in a tight-fitting bright pink dress singing on American Idol, as the new improved, thin Jennifer comes from behind, singing in a creepy duet with her former self. Ugh. Jennifer Hudson x 2 = even more annoying because she’s competing with herself to out-sing and (hard to believe) it gets more offensive than her “It’s a New Day” commercials! Gawd, it’s not even January 1st yet, and I can’t even think about how many times we’ll have to listen to this awful commercial for the next couple of months! Where are my ear plugs? Before I get a million Jennifer fans coming down on me, I should clarify!!! I NEVER said she was a bad singer in general and I do not dislike her. It’s her commercials that annoy me. There is a big difference hearing her sing one song, than hearing the weight watcher commercials played over and over ad nauseam. Okay, I admit the newest J Hud Weight Watcher commercials are not bad. The one with her singing “I am you, you are me, gotta stand up if we’re gonna be free” – with the other women who lost weight on the program. Her voice is strong without being over-the-top and it’s enjoyable to watch. There is another new commercial that is also equally better. This week, I did great: $158.72, which includes $100 for my first meat CSA delivery. I’ve spent $336.13 for the month of December, so that leaves a balance of $63.87 for the rest of the month. I’m thrilled that I’m still on budget for the month. Only one more week left and I feel confident! The only problem I foresee is iHerb.com is having a great 10% off sale for VIP customers, and I’m going to stock up on supplements, grains and other groceries. My order will be about $100, so it will take me over budget, but I’ll just adjust January’s total. I found an inspiring article on Small Notebook concerning food spending and how spending less is not necessarily the answer – blog comments are equally inspiring! Comparing what your family spends for groceries to another family can lead you down the path to frustration & self-doubt. Every family’s needs & values are unique. Just because there is a food blogger spending only $250 per month for their family of four doesn’t mean that is the best direction for your family! Do find inspiration from other frugal budgeters, but don’t try to fit your family’s spending into their food budget, because everyone’s circumstances are different! Back many many years ago, when food was REAL, families spent a lot more of their income on groceries (25% vs 10%). Most of us now have (more important) cell phone and internet to pay for, so food has become somewhat of an afterthought. Big Food has taken advantage by producing subpar food products that can be sold for much less than healthier alternatives. Cheap food gives the illusion of frugality, but in reality, it’s damaging our bodies and our way of life! Worse, while we’re spending LESS, we’re actually eating MORE! Calories are through the roof and meat consumption is out of control, polluting our bodies and environment. More Americans are obese, and chronic (deadly) illnesses like diabetes and heart disease are becoming the norm, pushing our medical expenses higher! So yes, I am still trying to curb my grocery spending and stick to a reasonable food budget, but I have to remember that food quality MUST remain the most important aspect vs price! My healthy budget goal is to eat unprocessed, seasonal, home-cooked meals while sticking to a $400 monthly budget for all food including groceries, dining out, entertaining, vitamins/supplements, and spices/herbs. So far I’ve spent $180.76 (total) for the month of December, so that leaves a balance of $219.24 for the rest of the month. This week’s total was $35.84, for two small trips (Saturday & Wednesday) to the local grocery store for essentials: Broccoli, bananas, dark chocolate, oranges, apples, pears, grapefruit, mushrooms, raisins, and Pomi tomatoes. This Saturday, our meat CSA will be delivered, and I’ve added a jar of honey to my order; it’ll add almost $100 to my spending for the month. I’ll have $121.84 to get me through 2 more weeks (including both Christmas & New Years Eve holidays). We’ll see how it goes. I’m not panicking yet! haha! Celebrity chef Emeril Lagasse was on the Dr Oz show the other day, and I’m not a regular Dr Oz fan, but I just happened to catch the show. At first I thought that Emeril would be the one getting advice from the doctor concerning his obesity problem, but I was shocked to realize it was Emeril that was giving the audience health advice! Emeril’s Must Have Items to Revolutionize Your Health – watch the 4 part video of his appearance. Does anyone else think it’s strange that an obese chef is dishing advice regarding how to live a healthy lifestyle? His three must-have items? Spices, non-stick pan, and gluten free pasta. Seriously? You have to narrow your list of items that will “revolutionize your health” and those are your three picks? How about adding more vegetables to your meal to bulk it up? Limit the processed pasta and eat more “whole” grains? Start your day with breakfast? Drink more water? The worst part? He tucked in a sly promotion of his own non-stick fry pan! He claims you can save calories and fat by using non-stick. No, Emeril, you don’t need 3 Tbsp of oil to saute vegetables in a stainless pan! I sometimes don’t use any oil at all, depending on what the dish is! And besides, what is so wrong with cooking with fat anyway? I’ll take cooking in my seasoned cast iron fry pan with a tsp of coconut oil over his toxic fuming non-stick pan any day! Ha! This situation reminds me of when Kirstey Alley was pushing her crazy weight loss products while obese, or when Dr Phil wrote his diet book! During the Dr Oz interview, Emeril avoids revealing any details about his own personal medical conditions, he does mention that he’s been trying to live healthier for the last two years. I’m wondering if he has diabetes, or a pre-diabetic condition, and that is what triggered his desire to “get help”. But at the same time, how can he expect people to take him seriously when he’s clearly still struggling with his own demons even after 2 years! I admit I always watch him when he is on HSN, selling his cooking products, but I find his sales tactics to be very questionable – following the typical HSN sales banter: ooh better order now, these are flying out the door. Our inventory won’t last the day! In fact, it’s ironic that while he’s now claiming to be healthy, just last weekend he was still hocking his “fry right or don’t fry at all” home frier on HSN. Talk about mixed messages! So, why do I continue to watch him if I don’t really like him? Well, I like watching HSN Cooking shows to learn about new kitchen products. And secondly, I used to really like him years ago. I enjoyed watching his TV shows and thought he was a caring person. I guess I am hoping to perhaps find bits of the old Emeril underneath the sly, pushy salesman. I’m still waiting! I’ve spent $141.57 during the first week of December, so that leaves a balance of $255.08 for the rest of the month. I’m a little bit nervous about this month, seeing that there’s an extra week plus the holiday, but I’m keeping the confidence up, and trying to plan ahead. Whole Foods was my first stop @ $58.80 – lots of produce, including local cranberries, organic leeks, bananas, organic apples, organic pears, organic acorn squash, broccoli crowns, organic carrots, fennel, organic lemons, meyer lemons, mushrooms, (local) cocktail tomatoes, and satsuma mandarins, plus Earth Balance mindful mayo, brown cow plain whole yogurt, and olives at the antipasti bar. I also needed some pantry items: white & brown rice, organic ketchup, and bulk whole caraway seeds. Trader Joe’s totaled $35.09: turkey bacon, raw almonds, peanuts, de-shelled pistachios, frozen organic corn, frozen organic peas, (2) frozen organic raspberries, frozen pesticide-free blueberries, and I was craving Barbara’s Multi-grain Shredded Spoonfuls cereal. I rarely ever buy cereal anymore, but I just love munching on this stuff, and it was a huge box for an excellent price! I also picked up some King Arthur whole wheat white flour at the local grocery for $2.99 and two dozen local eggs for $5.75. Dining Out: $33.45 – much higher this week since DH decided to replace the kitchen floor this week! Our local meat CSA will be delivered on Saturday December 17th, and I originally thought I should apply the cost as we cook/eat the meat. But that could be a nightmare to keep track of individual meats, so now I’m leaning toward adding the total each month as it’s delivered. I’m really trying this month, but with Christmas and New Years Eve, I might be forced to go over a little bit. If that happens, I am not going to beat myself up about it. It’ll be okay. I’ll try my best, but things happen. I’ll just deduct the amount from January! PS Next week, I won’t be so long-winded!!!! Today marks my first official post for the “Project Food Budget” – a group of bloggers like me, that are trying to stick to a specific food budget every week/month – they’re already at week 9! It also marks the end of the first month for My Own Healthy Budget challenge. My budget goal is to eat healthy, unprocessed, home-cooked meals while sticking to a $400 monthly budget for all food including groceries, dining out, entertaining, vitamins/supplements, and spices/herbs. There’s two of us eating 3 (mostly) meals per day. Breakfasts are usually on the small side on weekdays, and my husband occasionally eats take-out lunch at work. If needed, that $ comes out of his personal cash. So, yay, I survived my first official month, with $ to spare. Soo sooo oooh proud of myself! I need more practice in meal planning, but yesterday I tried to put together a week of dinners. We’ll see how easily it will be to follow. I’ll post next week on how I do. Today, I used my $40 Groupon coupon for GNC and bought 2 bottles of multi-vitamins, 1 bottle of calcium citrate, and a bottle of organic apple cider vinegar. Not bad for an investment of $19 a couple of months ago! Tomorrow I’m planning a trip to Whole Foods. I have my list ready on my iPhone, with estimated prices and I think I’ll be able to keep to $50-$60. This should get us through for 7-10 days before needing to go shopping again. I’m excited for our first CSA (local) meat delivery this month, and I won’t be applying the cost until I actually cook the meat, hoping to stretch what’s delivered for the next 6 months into the summer months.